A church was opened for the area in 1941 to the design of S T Hennell (Elleray (2004) p6) and the traditional looking lychgate probably survives from this. 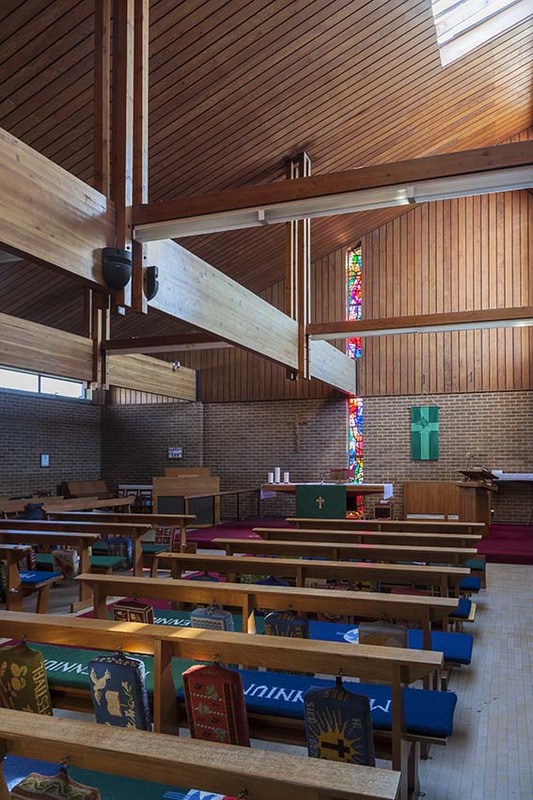 Otherwise, it was replaced by the present church in 1968, which was designed by J Wells-Thorpe. This consists of a relatively low, flat-roofed hall in light-coloured brick, with a taller church behind, which has a mono-pitched roof and is built of darker brick. Both parts are characterised by long and narrow windows, grouped and off-centre in the taller west-facing wall. Inside, the upper parts of the walls and the ceiling are boarded and the heavy roof-timbers are fully exposed. 1. 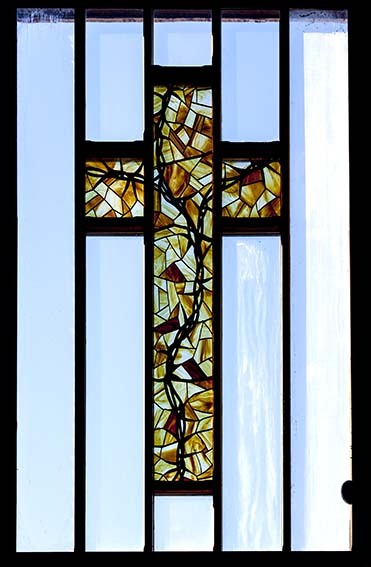 (East window) H Powell, a long narrow light with an abstract design, c1968 (DSGW 1972). 2. (South chancel, centre light) C Durant, 1998, semi-abstract crucifix in varied tones of brown and yellow (www.stainedglassrecords.org retrieved on 29/3/2013). 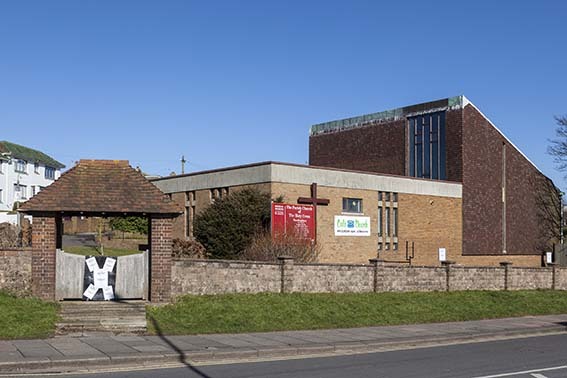 Another church, The Resurrection, South Woodingdean, dates from 1958-59 and was also designed by J Wells-Thorpe (Elleray (2004) p6). This was Anglican initially, but after Holy Cross was rebuilt became a Roman Catholic one dedicated to St Patrick (ibid).